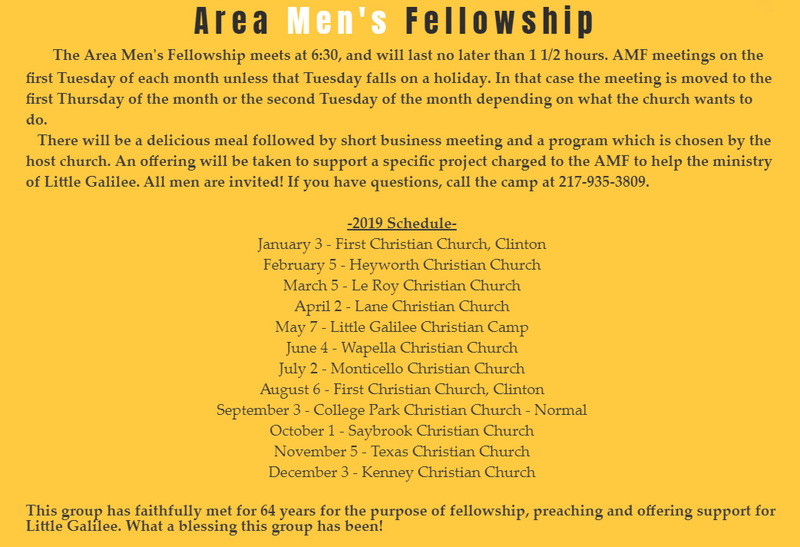 Area Men's Fellowship meets on the first Tuesday of each month unless that Tuesday falls on a holiday. In that case the meeting is moved to the first Thursday of the month or the second Tuesday of the month depending on the schedule of the host church. All meetings begin at 6:30 pm and a car pool leaves from the church at 5:45 pm. Meetings begin with a meal followed by a short business meeting and a program which is chosen by the hosting church. An offering is taken at each meeting to support the ministry of Little Galilee Christian Camp. Our goal is to have each meeting last no longer than 1 1/2 hours. All men are invited! Men's Breakfast is a new ministry for men that began in October 2017. We are excited to share how this ministry has grown and excelled! The breakfast is on a monthly schedule of the 1st and 3rd Wednesday mornings each month from 6:00 a.m. - 7:15 a.m. All men are welcome. You don't need to attend the church to be a part of this group. Breakfast is ready to eat at 6:00 a.m. and the message for the week starts at 6:15 a.m. There is no need to be done eating at this point. Grazing is allowed! The messages will vary week to week so if you happen to miss a breakfast you won't necessarily need to play catch up. Messages wrap up around 7:00 a.m. with some time at the end for Q&A allowing participants to leave for work no later than 7:15 a.m. We like to challenge our attendees to invite one guy to the breakfasts after their first attendance. If you have any questions please feel free to contact group leaders Alan Loy or Jeff Mayfield.